Yamaha RX-V673 review | What Hi-Fi? Always the bridesmaid, never the bride. That’s the story of Yamaha’s surround sound amps over the past few years. 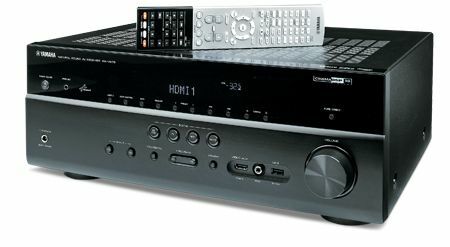 The company’s been producing some of its best products ever, only to be pipped at the final hurdle in tests by the Onkyo and Pioneer equivalents. But this year could be different. The Yamaha RX-V673 has been part of Yamaha’s UK tuning project, the same initiative responsible for the Award-winning A-S500 stereo amplifier. From the off, you can hear a different sonic flavour from previous generations of Yamaha at this level. The sound is clearer, more detailed and more exciting. But Yamaha’s traditional strength, its surround processing, remains as deeply impressive as ever. The amp promotes a hugely involving and immersive sound. Watch Indiana Jones And The Raiders Of The Lost Ark, and as Indy makes his way through the boobytraps and hazards inside the temple, the Yamaha conjures up a fantastic atmosphere. Subtleties such as trickles of running water and the pitter-patter of tiny tarantula feet have real immediacy, immersing you in Indy’s tricky predicament. When Mariam’s explosive-laden truck ignites, the explosion’s scale is second to none. Yes, you’ve got novel preset modes to choose from, such as ‘Hall In Vienna’ but you don’t need any of these to give you the feeling you’re at a concert. Play a music Blu-ray and the Yamaha’s natural vibrancy is more than enough to put you right there in the auditorium. Spin some two-channel tunes and the RX-V673 entertains with a brand of big, bold dynamics, mixed with a fine sense of timing and great level of detail. The Sony has slightly greater bass agility, but otherwise sound quality is excellent. Features and specification are well up to expectations at this price. AirPlay, absent on last year’s models, is now included, while there are six HDMI inputs, including one on the front panel. Pass-through of 4K content is supported, as is the ability to pass content through one of the HDMI inputs (and even change input) while in standby. Yamana’s newly styled remote is overcrowded, but the AV controller app works well. Icons are well organised, with all inputs at your fingertips on one screen. Volume controls are responsive to your commands; press the screen and the numbers rise or fall smoothly. The placement of menus and tabs makes sense, and it’s easy to flow from one screen to the next too. The V673 is DLNA-certified, and streaming from a NAS device on your network is a treat up to 24bit/96kHz. vTuner internet radio works admirably too, the clean on-screen menus allowing you to navigate with minimal hassle. This Yamaha is a formidable and hugely desirable home cinema amp. But is it good enough to take the top spot?